June 2012 ends with pre-monsoon in south-eastern Sindh that occurred from June 12 till June 15, otherwise the country was monsoon-free. Monsoon rains expected in Pakistan during the late first/early second week of July while in the lower parts there are chances of monsoon activity during the second week of July. However no pre-monsoon rain has occurred over any part of Pakistan since June 15 as forecasted by PWP. Monsoon rains expected in Pakistan during the late first/early second week of July while in the lower parts there are chances of monsoon activity during the second week of July. However no pre-monsoon rain has occurred over any part of Pakistan since June 15. Monsoon on the road of revival! Weak thunderclouds dissipating over coastal Gujarat. UAC would form in the Bay of Bengal after 24 hours. Monsoon would revive during the first week of July, tropical storm ‘Doksuri’ to affect the monsoon flow. Overall condition of monsoon improving over both the Arabian sea as well as the Bay of Bengal branch. Major monsoon activity observed in Mumbai and Chittagong during the last 24 hours. TS Doksuri – A game changer! Thundercloud forming over central Gujarat. UAC may form in the Bay of Bengal after 36 hours. Monsoon would revive during the first week of July, tropical storm ‘Doksuri’ to affect the monsoon flow. Monsoon rains expected in Pakistan during the late first/early second week of July. However no pre-monsoon rain has occurred over any part of Pakistan since June 15. A fresh upper air cyclonic circulations might form in the northern Bay of Bengal after 48 hours. No pre-monsoon activity in the northern parts of the country. Dense cloud formation taking place near south-western Indian coast near Goa and Kerala in the Arabian sea. In the continuation of June 23 update, Western disturbance ’11’ over northern Pakistan, no monsoon winds affecting any part of the country. Weak thundercloud over central Gujarat. Western disturbance ’11’ after wrecking havoc in northern Afghanistan is entering northern Pakistan. WD ’11’ has killed 37 people in Afghanistan and destroyed 100s of home. Although its intensity is feeble now, it is causing thunderclouds to enter northern and some central parts of the country along with the moisture from the Arabian sea, where there are chances of isolated showers with strong winds in those areas till few days including Islamabad. No pre-monsoon activity is expected in northern areas till this week. Monsoon is still on break and is expected to revive during the last days of June or the first week of July. Pre-monsoon thundercloud formation has once again started taking place over Gujarat, this activity could affect south-eastern Sindh during this week. Upper air cyclonic circulations persists over north-west Bay of Bengal. Monsoon is gaining intensity, it has advanced into Bihar and Jharkhand. The same upper air cyclonic persists over north-west Bay of Bengal, it is likely to bring widespread downpours to north-eastern India during the last days of June/first week of July. Tropical storm ‘Talim’ affects monsoon flow – Low pressure fails to form on June 20 as it was forecasted. With the entrance of westerlies, monsoon goes on a small break. Upper air cyclonic circulations in the north-west Bay of Bengal persists. Monsoon is facing difficulties due to recent super typhoon ‘Guchol’ and recent tropical storm ‘Talim’ in the western Pacific ocean, it would gain peak again. Upper air cyclonic circulations dissipates in the Arabian sea. Bay of Bengal’s UAC to form into a low might form during the this week. Western disturbance “10” has disturbed the pre-monsoon activity in Sindh. The trough of WD attracted the pre-monsoon moisture over central India towards Indian Kashmir. Almost half of India is now covered with monsoon’s cloud-cover. 18 mm rainfall occurred in Mumbai today. UAC in the northern sector of the Arabian sea persists. Bay of Bengal’s UAC to form into a low might form during the coming early week. With the entrance of western disturbance “10” the pre-monsoon activity in Sindh has been disturbed. Monsoon is expected to force its entry into Bombay on June 18, an eight-day delay. Mostly showers occurred in the city throughout the day, which are likely to gain intensity in the coming days while heavy rain-shower occurred in Goa. Upper air cyclonic circulations persists in the Arabian sea while another over Bay of Bengal that is likely to intensify into a low pressure during the coming week as forecasted by PWP from June 8. No pre-monsoon activity observed today in Sindh or any other province of Pakistan. Upper air cyclonic circulations near the western coast of India persists while another in the Bay of Bengal which is expected to intensify into a low pressure. Coastal pre-monsoon thunderstorm that had been persisting since last few days and weakened and it’s northern half high level clouds are passing through south-eastern Sindh into Rajasthan. A new thundercloud may also enter the eastern part of Sindh by late night, high level clouds expected in Karachi. Other parts of Pakistan are under the influence of westerlies. Above image is by PWP Follower Umair Dero. Upper air cyclonic circulations persists in the Arabian sea and Bay of Bengal, both these weather systems are likely to strengthen the monsoon winds in coming days. Upper air cyclonic circulations persists in the Arabian sea near western coast of India. 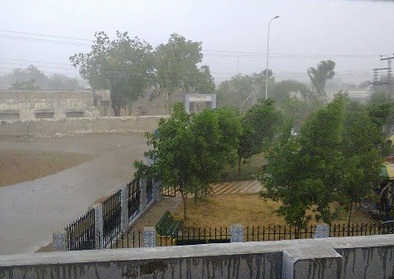 Pre-monsoon thunderclouds that formed over Gujarat entered south-eastern Sindh and have caused showers with fast winds, this is the first monsoon rain of the current year across Pakistan. Now these clouds have weakened and are moving back to Rajasthan as westerlies gain strength. Another thundercloud is dissipating over central Gujarat. Another circulations in the Bay of Bengal persists. Above is the picture by PWP Reader Abdul Jabbar from south-eastern Sindh who took the shots from this car. Upper air cyclonic circulations again forms in the Arabian sea near western coast of India. Pre-monsoon thunderclouds over Gujarat dissipating as it moves in a NNE direction, it has touched the border of south-eastern Sindh which is the first activity related to the monsoon in Pakistan. Large high and medium level clouds over Rajasthan and other adjoining provinces of India touches the Pakistani Punjab’s eastern border. Now the clouds are moving towards northerly direction. Circulations in the east-central Bay of Bengal, it has deepened to some extent. Low pressure area may form during late this week. Circulations in the east-central Bay of Bengal, it has deepened to some extent. Low pressure area may form during late this week. 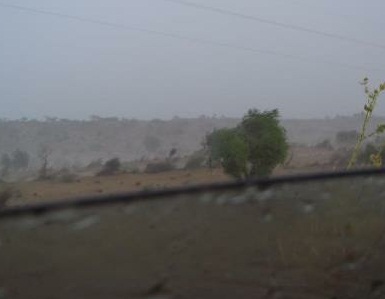 Pre-monsoon showers continue in Indian state of Gujarat and Mumbai city, monsoon has slightly weakened thus a delay has occurred in the city against its normal date of June 10. Upper air cyclonic circulations in the east-central Bay of Bengal would intensify into a low pressure area during the coming week. Monsoon may advance into Mumbai on June 10 after advancing into some south-western coastal areas. Upper air cyclonic circulations persists near western coast of India, another cyclonic circulations have formed in the east-central Bay of Bengal, it is likely to intensify in the coming week into a low pressure area. Upper air cyclonic circulations persists over east-central Arabian sea and adjoining western coast of India, trough extending into central India. An another Upper air cyclonic circulations may form in the Bay of Bengal during the coming week. Upper air cyclonic circulations persists over east-central Arabian sea and adjoining western coast of India, trough extending into central India. Heavy showers occurred in coastal Kerala, Goa and Karnataka. Moisture incursion would take place in Gujarat. The upper air cyclonic circulations is sending a monsoon current towards Kerala where strong moist-laden winds have reached the coast of Kerala. Showers occurred in the state during the evening as more thunderstorms are also forming the near the coast. The upper air cyclonic circulations in the south-west Arabian may intensify into a weak low pressure after that it would start to weaken, it may move towards the western Indian coast where it would persist for few days as an UAC. A low pressure area might form in the south-western Arabian sea after 12 to 24 hours, it is likely to affect the western coast of India. It may deepen to some extent. A low pressure area might form in the south-western Arabian sea after 24 to 36 hours and might deepen to some extent, it is likely to move towards Gujarat coast as a remnant during the end of the coming week.